Here's a meal the Japanese invented for Western customers. It's popular with many people in Japan and some restaurants specialize in making the dish. Omelete rice (オムライス) is easy to prepare at home and some recipes will be posted. The dish above, was listed as pineapple omurice on the menu at a cafe. There was a chunk of pineapple in the salad and, it was tangy. The meal was way more than what I would normally eat for a lunch but, I ate it all. Looking for recipes, I also ran across one variation of the dish that's new, to me. Somebody invented Taco-omu Rice ! That's a meal, I might have to sample someday but, I'll wait for awhile and see. The Irish in me says, be patient and maybe, they'll come up with something better. Corn-beef and Cabbage Omelet anyone ? 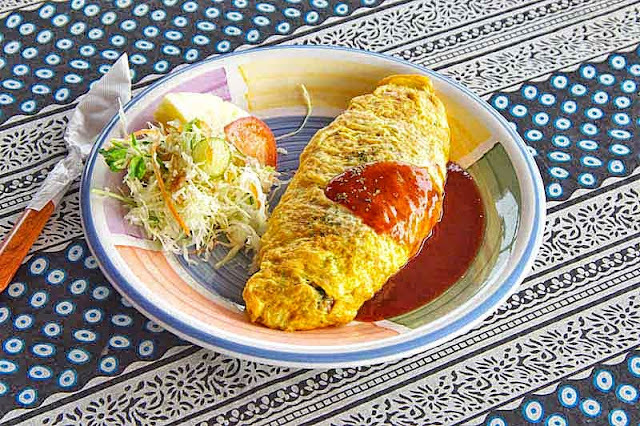 To make your own Omurice, checkout these Easy Japanese Recipes. The feast, pictured at the top of the page was prepared at Tachigaa Waterfall Cafe.